Dental 3D printing: how does it impact the dental industry? There is obviously a growing use of 3D printing in the medical industry. Indeed, it can be used to create tools, prosthesis, dental implants, and so on. Soon, it will even be used for bioprinting, in order to 3D print tissue-like structures. But in this blogpost, we are going to focus on the evolution of 3D printing in the dental sector. Indeed, the impact of 3D printing in the dental industry is quite important and this sector is actually making the most of the additive manufacturing technology. At EnvisionTEC, a 3D printer manufacturer, the sales of 3D printers for dentistry increased of 75% from 2015 to 2016. This is the proof that it is evolving quickly and that the use of this printing technology is relevant for this sector. It’s now possible for professionals of the dental sector to do some oral scanning and CAD design by themselves. Then, they can 3D print with their own desktop 3D printer or with an online 3D printing service. Dental businesses are progressing, and new technologies such as 3D printers and 3D scanners dedicated to dental work are developed. Dental laboratories are more and more using it to develop new working methods, and to create many devices like 3D printed braces for a faster teeth alignment, orthodontic appliance or 3D printed implants and dental crowns. Additive manufacturing is the perfect solution to get customized items, for all sectors. But it becomes even more relevant when it comes to the medical sector, as it allows great realizations such as prosthesis. In the healthcare field, some solutions have to be adapted to the patients. Typically, prosthesis or implants have to match with the patient’s morphology. And it is also particularly true for dentistry, because everybody has his own dentition, all patients’ mouths are different. It is now possible to get an accurate 3D model of the patient’s dentition, that will lead to 3D dental restoration, with solutions totally adapted to the patient. Dental 3D printing is the key of modern dentistry, as it is really helpful for dental labs. Digital dentistry is wide-spreading quite fast in the industry for many reasons. Like we said, it is an easy way to get customized items. Moreover, it is a cost-effective and time-saving method. For example, if your 3D printed device doesn’t fit, you just have to modify your 3D design. You don’t have to redo the whole process as you would have with injection molding! Let’s see how this technology is changing the working methods of the dentistry sector. How can the 3D printing technology help dental professionals? Researchers from the King Abdullah University of Science & Technology in Saudi Arabia are developing “smart 3D printed braces”. The aim of these braces is to align and straighten the teeth faster, thanks to LED lights. These semi-translucent 3D printed braces put a battery on each tooth, in order to power the light, because the energy actually helps the teeth to move faster. In case you’re wondering, no, the light can’t be seen by the naked eye, it is a discrete process. The team researchers worked on non-toxic lithium batteries, but also the flexible properties of these braces to make it safe and comfortable. These 3D printed braces are not accessible for a public use yet, but it gives a nice insight on the researches made in this sector. Aligners are a type of braces correcting teeth alignment. 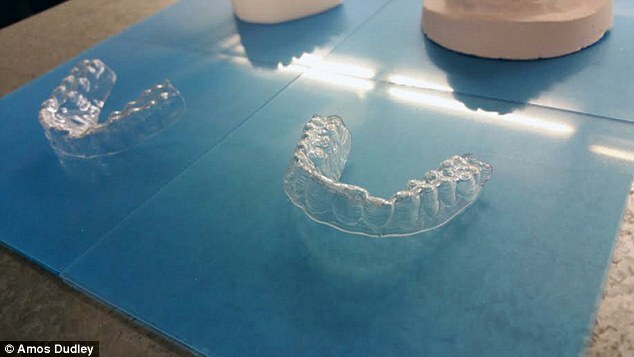 Amos Dudley, a college student of the Jersey Institute of Technology created his own aligners. Because he couldn’t afford the total cost of the traditional set of braces, he 3D printed his own braces. It is the same process as the well-known Invisalign invisible aligners, but this student did a DIY version. Amos Dudley’s orthodontic aligners only cost $60, and that is an important advantage as dental devices are ordinary extremely expensive. He built a set of braces by himself with models of his teeth and a Stratasys 3D printer. The 12 aligners are going to follow the progression and movement of its dentition. If it is not recommended to create a dental device by yourself, the project of this student is a success. Additive manufacturing also has an important role in dental implant surgery. It is actually possible to create a 3D model to replace a missing tooth. Indeed, 3D printing allows to get a replacement tooth faster and with more accuracy than with traditional methods. It is also an easier and economical method, and the final product can have a really good finish. 3D printing and dental restoration have a bright future together to come. 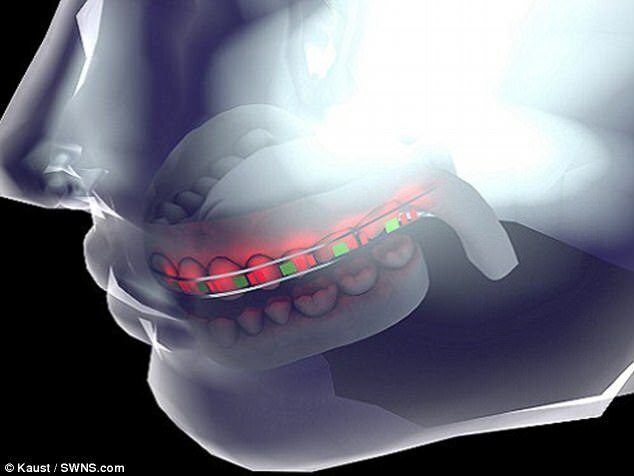 In China, an autonomous 3D dental implant intervention has been managed by the Dr Zhao Yimin. This oral rehabilitation professional created a robotic dentist, able to lead an implant surgery by itself. This impressive surgery took an hour long and was a real success. It is also possible to 3D print complete dentures, with gum and teeth, that have to be printed with biocompatible materials. Indeed, even the denture base is 3D printable and can be adapted to the patient’s morphology. For the moment, 3D printed dentures are only created for clinical tests, but we assume that it will be a common 3D printed product really soon. Additive manufacturing allows to produce crowns very quickly, as the process can be done by the dentist by himself. 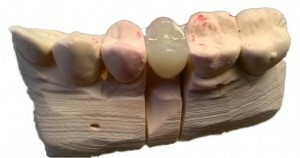 It is one of the most common applications of 3D printing in dentistry. 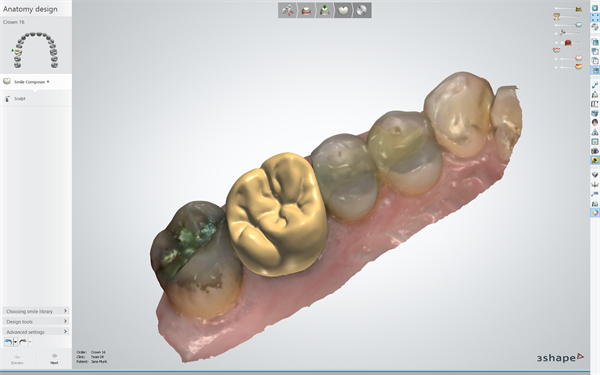 It is possible to get a scan of the patient’s teeth, to model it and to directly print the crown. This process is really time-saving, and the professional can modify and reprint the crown if there is a mistake. Of course, this is not an exhaustive list of what you can 3D print in the dental industry, it is also possible to 3D print surgical devices, night guards, and so on. 3D printing can also be used for the professionals themselves. Indeed, it is possible to 3D print not only braces, biocompatible surgical guides, implants or crowns, but also tools. This way, it is possible to adapt perfectly the devices to the working methods, or processes. This method to produce tools is usable for all the medical industry. How to 3D print for dental applications? It is becoming easy to 3D scan the dentition of a patient as dental 3D scanners are now available on the market. If you are working from a traditional CT scan, you obtained thanks to your scanning process, you’ll have to use two different software to work on 3D printing. Medical scans are usually a DICOM format, that is not supported by usual modeling software. You can use OsiriX a viewer that enables you to convert and post-process your file in 2D or 3D. This way, you can combine the use of two software to work efficiently on the computerized imaging, a.k.a CT scan (computed tomography scan). A lot of 3D modeling software dedicated to the medical industry are available. If not for 3D printing, these 3D software can help you to get a good 3D visualization. The use of a 3D viewer are even more common to get a better visualization of a problem. 3D modeling software can help you to modify and adapt the 3D model to your needs. Possibilities of dental modeling are endless with these tools. 3Shape, that is specifically made for 3D modeling for dentistry. Different packages are available, it depends on your needs. You can get a version for crowns and bridges, one for scans, or the premium packages with all the different options. DWOS Model Builder, a CAD software developed by Dental Wings. This 3D software enables you to create models or implants with a good accuracy. Blender, even if it is not a 3D modeling software dedicated to a medical use, some professionals are using this traditional CAD software. If you want more information about 3D modeling with Blender, check out our tutorial. Desktop 3D printer or online 3D printing service? Once your 3D model is ready, you have two different options to 3D print it. You can get desktop 3D printers, like the Form 2, used by some professionals in the dental industry. Dental 3D printers are more and more used as they allow the dentist to work directly by himself, and then, to save time. EnvisionTEC 3D printers are also a good solution, allowing to develop direct manufacturing. If you don’t want to deal with all of this printing process, you can access the 3D printers of an online 3D printing service like Sculpteo. You’ll get an affordable access to professional additive manufacturing. You can choose the technique, the materials, and the finishes that you need for your 3D printed dental work. What 3D printing technique should you use? It depends on the nature of your project and the use of the object you are planning to produce. Is it tools, dental appliances, crowns, bridges? Digital dentistry requires special 3D printing materials. Indeed when it comes to dental products, you have to use a biocompatible material, like the Dental SG, or the biocompatible resins offered by Carbon. Some of the resins used for 3D printing on our online 3D printing service are biocompatible resins. For the medical tools, other medical devices or prototypes, you can choose among a wide range of printing materials. Check out our 3D printing materials page for more information. If 3D printing can be used for production, it can also be used to prototype at a lower cost. We hope that this blogpost about dental 3D printing was enlightening. There are many applications of digital fabrication in the medical industry, it is useful for the dentist and for the researchers, as it is proved by the smart 3D printed braces developed in Saudi Arabia. As you can see this amazing manufacturing process is already getting its bearings, and the future of 3D printing in dentistry seems promising. It could help to create even more dental products for dental labs in the upcoming years. 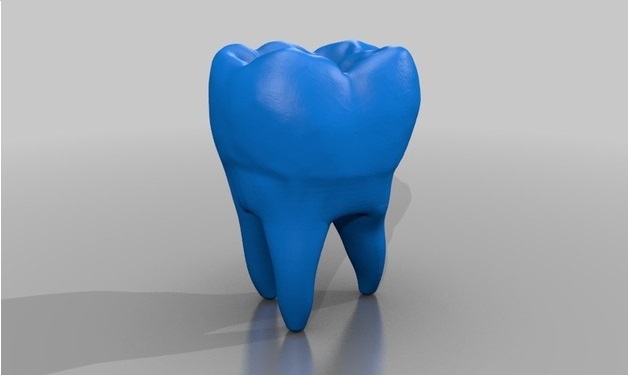 You are interested in the benefits of 3D printing for dental practice? You work in the dental sector and you want to 3D print orthodontic models? Upload your 3D file on our 3D printing service and get your 3D printed models.